The recently described cytokines IL-19, IL-20, and IL-24 share structural homology with IL-10 and are therefore classified as members of the IL-10 family of cytokines. Although it has long been speculated that signaling by their heterodimeric receptor complexes (IL-20R1/IL-20R2 and IL-22R/IL-20R2) influences immunological processes, the target cells for this group of cytokines are still unclear. By generating a knockout mouse strain deficient for the common IL-20R β-chain (IL-20R2), we show that IFN-γ and IL-2 secretion is significantly elevated after stimulation of IL-20R2−/−-deficient CD8 and CD4 T cells with Con A or anti-CD3/CD28 in vitro. IL-10 secretion by activated IL-20R2−/− CD4 cells was diminished. Consistent with our in vitro results, significantly more Ag-specific CD8 IFN-γ+ and CD4 IFN-γ+ T cells developed to locally applied DNA vaccines in IL-20R2-deficient mice. In a T cell-dependent model of contact hypersensitivity, IL-20R2 knockout mice were more sensitive to the contact allergen trinitro-chloro-benzene. Thus, IL-20R2 signaling directly regulates CD8 and CD4 T cell answers in vitro and in vivo. For the first time, we provide evidence that IL-19, IL-20, and IL-24 are part of a signaling network that normally down-modulates T cell responses in mice. The recently described cytokines IL-19, IL-20, and IL-24 share structural homology with IL-10 and are therefore classified as members of the IL-10 family of cytokines, which also includes IL-22 and IL-26 (1, 2, 3). Members of this family bind to heterodimeric transmembrane receptor complexes that are composed of a long α-chain (R1) and a shorter β-chain (R2). IL-19, IL-20, and IL-24 activate a heterodimeric receptor composed of the IL-20R1 α-chain and the IL-20R2 β-chain (IL-20R class I). IL-20 and IL-24 can also use the IL-22R as an alternative α-chain (IL-20R class II), whereas IL-19 signals exclusively through the IL-20R1/IL-20R2 dimer (4). Current knowledge of the biological effects of these new IL-10-type cytokines is sparse. They seem to be mainly produced by cells of lymphoid or myeloid origin (3, 5), but keratinocytes and other epithelial cells may also be a source for IL-19, IL-20, and IL-24 (6). There is strong evidence that IL-20 and possibly also IL-19 and IL-24 are implicated in psoriasis because their expression increases with progression of the disease. IL-20 up-regulates inflammatory genes such as chemokines, proteases, and defensins in the skin (7, 8, 9). Epidermal hyperplasia was inhibited in an IL-23-dependent psoriasis mouse model when IL-20R2 signaling was missing (10). IL-20 was detected in synovial fluids of patients with rheumatoid arthritis (11), and it may participate in the development of atherosclerosis. rIL-20 and rIL-24 might promote angiogenesis (12, 13). IL-19 was reported to up-regulate Th2 cytokines in an animal model of asthma (14). The mechanisms regarding how IL-19, IL-20, and IL-24 influence the pathogenesis of immunological driven diseases are not conclusively resolved. Quantitative analysis of the RNA expression of their receptor chains suggests that stroma/parenchymal cells are the major targets of these cytokines (5, 15, 16). Given their immune cell origins, these cytokines thus may be candidates for cross-talk between resident parenchymal cells of various organs with tissue-infiltrating leukocytes, monocytes, and APCs. Signaling of their receptors in immune cells has not been clearly demonstrated. In comparison with the high expression levels of IL-20R1, IL-22R, and IL-20R2 mRNA in some parenchymal cells (e.g., skin), their constitutive mRNA levels in lymphoid cells are low (5, 15). High-affinity Abs specific for the receptor chains are not yet available. Nevertheless, recent in vitro studies allow the presumption that these cytokines have Th2-polarizing effects on cultured naive T lymphocytes (17) and are able to induce IL-10 in macrophages and dendritic cells (DCs)4 (18). Several reports showed functional effects of rIL-19, rIL-20, and rIL-24 on immune cells (19, 20). To date, functional studies relied on the use of rIL-10-type cytokines over a longer stimulation period (17). Thus, unwanted side effects due to impurities of the cytokine preparations could not be excluded. Summarizing the above, it is still controversial whether lymphocytes are targets for IL-19, IL-20, or IL-24. The closely related cytokine IL-22 binds to a heterodimeric receptor complex consisting of IL-22R and IL-10R2 chains. Recent reports show that IL-22 strengthens innate immune responses, for example, of keratinocytes, hepatocytes, and colonic epithelial cells. There is growing evidence that IL-22 does not act on immune cells, but has important functions in innate tissue defense mechanisms (21, 22, 23). To analyze the effects of IL-19, IL-20, and IL-24 on T cells in vitro and on specific Ag-dependent immune responses in vivo, we generated a knockout mouse with a genomic deletion of the first exon of IL-20R2. Because IL-20R2 is the common receptor subunit for this group of cytokines, we were able to analyze adaptive immune responses in vivo and in vitro, when signaling of all three cytokines is missing. For the first time, we provide evidence that IL-20R2 modulates the T cell phenotype after activation in vivo and in vitro. In this study, we show that IFN-γ and IL-2 secretion is elevated after stimulation of IL-20R2−/−-deficient CD8 and CD4 T cells in vitro. In addition, IL-10 secretion by cultured IL-20R2−/− CD4 cells was diminished. We found that IL-20R2 enhances specific T cell responses to locally (i.m. or intradermal (i.d.)) applied DNA vaccines in vivo. Primary and secondary CD8 T cell responses to Ag were 2- to 3-fold higher in IL-20R2−/− mice than in IL-20R2+/− mice. In a T cell-dependent model of contact hypersensitivity (CHS), knockout mice showed an increased response upon elicitation with the contact allergen trinitro-chloro-benzene (TNCB). Thus, the cytokines IL-19, IL-20, and IL-24 act directly on CD8 and CD4 T cells and attenuate the development of specific CD8 T cell responses to DNA vaccines and contact allergens. C57BL/6J (B6), BALB/cJ, OT I-Rag−/−, OT II-Rag−/− (The Jackson Laboratory), and IL-20R2−/− mice were kept under standard pathogen-free conditions in the animal colonies of Ulm University. Male and female mice were used at 8–14 wk of age. All animals received humane care. Animal experiments were approved by a state-appointed board on animal ethics and were performed according to international guidelines of animal experimentation. A 9-kb genomic fragment of the IL-20R2 gene was generated by PCR (genomic DNA of mouse strain 129 Ola) and sequenced, and the sequence was confirmed by data bank analysis. Mapping of the transcriptional start of the IL-20R2 gene by RACE as well as expressed sequence tag (EST) searches gave no hints for an alternative exon 1 (data not shown). The targeting vector was constructed with homologous 5′ and 3′ sequences (1.3-kb short arm; 5.2-kb long arm). A total of 1.7 kb of genomic sequence, including start codon, signal peptide, 1.3 kb upstream of exon 1 (necessary for transcription; our unpublished data), and 350 bp of the first intron of the IL-20R2 gene, was replaced by a thymidine kinase promoter-driven Neo gene sequence by standard cloning techniques and cloned into the pcrXGTK target vector. Embryonic stem (ES) cells from 129/ola mice were transfected with the IL-20R2 pcrXGTK target vector that contained the neomycin and the thymidine kinase gene to select and expand targeted ES clones. Expanded clones were screened by RT-PCR and Southern blotting for successful deletion of the first exon of IL-20R2. Chimeric mice were generated by injection of targeted ES cell clones into blastocysts. Blastocysts were then implanted into the uterus of BALB/cJ female mice, to complete the pregnancy. Chimeric mice were bred either with C57BL/6J (B6) mice or BALB/cJ mice, and the resulting F1 mice were intercrossed and screened by PCR and Southern blotting. Location of PCR primers and Southern probes that were used to discriminate IL-20R2+/−, IL-20R2−/−, and IL-20R2+/+ genotypes is shown in Fig. 1⇓B. Targeted disruption of the mIL-20R2 gene. A, Genomic structure of IL-20R2 gene on chromosome 9. Small grey rectangles: seven exons corresponding to mRNA and protein domains marked below (number 1–7). SS, signal peptide; FN, fibronectin-binding domain; EC, extracellular part; TM, transmembrane; IC, intracellular part; UTR, untranslated region. Knockout construct (B): target vector. TK-Neo, neomycin resistance gene under control of thymidine-kinase promoter; HSV-TK, thymidine-kinase under control of herpes simplex promoter; P, PCR primer; S, Southern probe. C, Southern analysis of targeted ES cells and mice. Genomic DNA was digested with XbaI for IL-20R2-specific Southern and with NsiI for Neo-specific Southern. Southern probe for IL-20R2 (S1) hybridizes to 5156-bp (wt allele) and 6670-bp (targeted allele) DNA fragments. The Neo-specific probe (S2) hybridizes to a 4000-bp (targeted allele) DNA fragment. ES/Neo, ES cell with stable insert of neomycin resistance gene outside the IL-20R2 locus; ES+/−, ES cell clone with successfully targeted IL-20R2 gene; F1, IL-20R2 genotype of first intercross generation (IL-20R2+/− × IL-20R2+/−); F1+/−, heterozygous deletion of IL-20R2; F1+/+, wild-type IL-20R2 alleles; F1−/−, knockout of IL-20R2 (D) LPS induction of IL-20R2 RNA. RNA of untreated and LPS-treated (4 h, 4 mg/kg) IL-20R2+/+, IL-20R2+/−, and IL-20R2−/− animals (same genetic background) was prepared. RNA was reverse transcribed and analyzed by PCR with primers annealing to exons 1 and 7. After LPS injection, successful induction of acute phase was followed by IL-6 ELISA and quantitative PCR (data not shown). No mRNA was detectable in LPS-treated IL-20R2−/− animals. One example of three similar experiments is shown. Each lane represents one animal. β-actin was used as reference gene. Lane 13, Control without RNA. Heterozygous offspring of the C57BL/6 backcross were intercrossed at generations 6 and 10 to get IL-20R2−/− mice. BALB/cJ IL-20R2−/− mice were received by intercrossing heterozygous mice of backcross 7 and 12. For all experiments, heterozygous or wild-type mice of the same backcross generation and genetic background were used. RNA was prepared from spleen, liver, or T cells using the RNAeasy mini kit (Qiagen). Genomic DNA was removed with DNase (Qiagen). A total of 2 μg of RNA was reverse transcribed using SuperScript reverse transcriptase, according to the manufacturer’s instructions (Invitrogen). Primers are listed in Table I⇓ and Ref. 24 . The housekeeping gene cyclophilin (24) or commercially available primers from (RT2PCR primers; SABiosciences) for the housekeeping genes mHprt1 or mβ-actin were used to equalize cDNA amounts between preparations. Quantitative and semiquantitative PCR was performed, as described previously (24). Cytokines in supernatants were either detected by conventional double-sandwich ELISA (IL-2, IFN-γ, IL-10) using detection and capture Abs from BD Biosciences, as described (25), or by flow cytometry (Fluorikine xMAP Technology, on workstations with Luminex IS Software v2.3). For conventional ELISAs, extinction was measured at 405/490 nm on a TECAN microplate-ELISA reader (TECAN) using the EasyWin software (TECAN). For quantification of cytokines from cell culture supernatants, a mouse cytokine 20-plex assay kit (Invitrogen) was conducted per manufacturer’s instructions. Cytokine 20-plex assays were analyzed on a Luminex 100 LiquiChip Workstation (Qiagen), and the data were analyzed using LiquiChip Analyzer software v1.0.2. IFN-γ, IL-10, IL-4, IL-5, and IL-13 concentrations were further confirmed with Fluorokine MAP mouse cytokine kits from R&D Systems. ELISAs were analyzed on BioPlex 200 Workstation (Bio-Rad) with Bioplex Manager Software 4.1 (Bio-Rad). For the quantification of Igs in serum, suspension arrays based on xMAP technology were conducted in principle, as described above and published previously (26). In addition, IgE levels determined by xMAP assays were verified by a conventional ELISA (BioLegend). All xMAP assay measurements were conducted for a minimum of 100 beads. Statistical significance of differences in Ig and cytokine concentrations was analyzed using the Mann-Whitney U test. Values of p < 0.05 (∗) were considered statistically significant. LPS (Escherichia coli K235; Sigma-Aldrich) was dissolved in PBS, and mice were injected i.p. with 5 mg/kg. The hepatitis B surface Ag (HBsAg)-encoding fragment of hepatitis B virus (subtype ayw) was cloned into pCI vector (Promega). The complete OVA coding sequence was cloned into pCI/S. The Ag sequence in the resulting pCI/S and pCI/OVA vectors is under the control of the CMV immediate early promoter (27). The i.m. nucleic acid immunization was achieved by injecting 50 μg (1 μg/ml) of plasmid DNA into each tibialis muscle, as described previously (28). Intradermal injection of 2 μg of particle-loaded DNA with the Helios gene gun system (Bio-Rad) was performed as described (27). Mice were vaccinated once and analyzed at day 12. For boost experiments, mice received a second application of vaccine at day 30 after priming and were analyzed at day 42. Spleens were removed and passed through a metal mesh to obtain single-cell suspensions. Erythrocytes were lysed in NH4Cl buffer (0.14 M NH4Cl and 0.17 M Tris (pH 7.2)). After washing, spleen cells were cultured in 200 μl of round-bottom microwells in RPMI 1640 medium supplemented with 5% FCS, 2 mM l-glutamine, and antibiotics, or used for further purification steps. CD4/CD8 T cells were isolated by MACS (negative selection; Miltenyi Biotec) exactly as described by the supplier. Purity of T cells was analyzed by flow cytometry (FCM) analysis and was greater than 98%. T cells (2 × 105) were cultured in round-bottom microwells in 200 μl of RPMI 1640 medium supplemented with 5% FCS, 2 mM l-glutamine, and antibiotics. Con A (Sigma-Aldrich) or anti-CD3/CD28 beads (Dynabeads; Invitrogen) were added 1 h after preparation. Con A was added to cell cultures at 1 μg/ml, and anti-CD3/CD28 beads were adjusted to one bead/cell, unless described otherwise in the figure legend. Thymidine incorporation assay was performed to follow growth of T cells. A total of 1 × 105 cells/well was cultured in flat-bottom 200-μl wells. Cells were pulsed for 6 h with 1 μCi/well [3H]thymidine (Amersham Biosciences) at day 2 of culture. Thymidine incorporation was measured by liquid scintillation counting. Mean values of triplicates (±SD) are shown. DCs were CD11c purified from spleen by MACS (Miltenyi Biotec), according to the supplier’s protocol. CD11c+ DCs were pulsed with OVA peptide (Kb/OVA257–264 SIINFEKL recognized by OT I CD8 or Ab/OVA323–339 ISQAVHAAHAEINEAGR recognized by OT II CD4) for 4 h and washed, and 1 × 104 DCs were cocultured with 1 × 105 MACS-purified T cells from OVA TCR transgenic mice in 200 μl of RPMI 1640 (29). Spleens of OT I-RAG−/− mice were used to isolate CD8, and spleens of OT II-RAG−/− mice were used to isolate CD4 cells. Cytokine in supernatants was determined at different time points of the coculture. Spleen cells (1 × 107/ml) were incubated for 4 h in RPMI 1640 medium with 1 μg/ml Kb/S190–197 VWLSVIWM or KbOVA257–264 SIINFEKL or nonspecific control peptides, as described (25). After 1 h, brefeldin A (BFA) was added. For determination of CD4 frequencies, spleen cells were stimulated ex vivo with rHBsAg (10 μg/ml) (25). After 20 h, BFA (2.5 μg/ml) was added for 4 h. Cells were harvested and surface stained with PE-conjugated anti-CD8 mAb (BD Pharmingen) or anti-CD4 mAb (BD Biosciences). Surface-stained cells were fixed with 2% paraformaldehyde in PBS before intracellular staining for IFN-γ. Fixed cells were resuspended in permeabilization buffer (HBSS, 0.5% BSA, 0.5% saponin, and 0.05% sodium azide), incubated with FITC-conjugated anti-IFN-γ (or anti-TNF) mAb (BD Pharmingen) for 30 min at room temperature, and washed twice in permeabilization buffer. Stained cells were resuspended in PBS supplemented with 0.3% (w/v) BSA and 0.1% (w/v) sodium azide. Numbers of CD4 or CD8 IFN-γ+ T cells per 105 splenic CD8 T cells were determined by FACS. Alternatively, freshly isolated cells were washed twice with FACS buffer (PBS/0.3% w/v BSA and 0.1% w/v sodium azide). Total Ag-specific CD8 T cell frequencies in spleen cells (1 × 107/ml) were detected by tetramer staining after blocking of unspecific binding of Abs to FcRs with mAb 2.4G2 directed against FCγRIII/IICD 16/CD32 (0.5 μg of Abs/106 cells/100 μl). Cells were then incubated with allophycocyanin-conjugated CD8 or CD4 mAb (BD Biosciences) and PE-conjugated tetramers Kb/S190–197 VWLSVIWM or Kb/OVA257–268 SIINFEKL (provided by the tetramer facility of National Institute of Allergy and Infectious Diseases) for 30 min at 4°C. Cells were washed twice in FACS buffer and analyzed by FCM, as described (25). Briefly, cells were washed twice and FcRs were blocked with mAb 2.4G2 (BD Biosciences) to prevent unspecific binding of Abs. Cells were washed and incubated with the relevant Abs for 30 min at 4°C and washed twice. FCM was performed by FACSCalibur (BD Biosciences). The forward narrow angular light scatter was used as an additional parameter to facilitate exclusion of dead cells and aggregated cell clumps. Data were analyzed using the WinMDI software. Induction of CHS was performed, as described previously (30). In brief, BALB/c IL-20R2 mutant mice or wild-type littermates were painted on their abdominal skin with 100 μl of acetone (background reaction) or 7% TNCB in acetone at day 0. On day 5, mice were challenged by painting 10 μl of 1% TNCB on both sides of the ears. Ear thickness from left and right ear was measured with an engineer’s micrometer (Mitutoyo) before and 24 h after challenge, and ear swelling was calculated. Data were analyzed using the GraphPad Prism software (version 4.0). Values were presented as means ± SD. Unless otherwise stated, at least three animals per group/time point were used in each experiment. Experiments were repeated three times. B6, IL-20R2+/−, and IL-20R2−/− mice were always treated in parallel. To disrupt the IL-20R2 gene expression, the first exon (Fig. 1⇑A) was deleted by homologous recombination. Successful deletion of the IL-20R2 allele was verified by PCR and Southern blot with specific probes (S) and primers (P) annealing outside of the target sequence (S1, P1) and within the target sequence (S2 and P2, P3) (Fig. 1⇑, B and C). We showed previously (24) that the IL-20R2 mRNA is up-regulated in the liver after in vivo injection of LPS. This LPS-induced expression of the IL-20R2 mRNA was not detectable by RT-PCR in IL-20R2−/− mice (Fig. 1⇑D), showing that the IL-20R2 gene is successfully inactivated in IL-20R2−/− mice. IL-6 ELISA in sera and IL-6 quantitative PCR of liver and spleen of all LPS-injected mice was performed to follow proper induction of the acute-phase reaction (data not shown). IL-20R2−/− mice revealed no statistically relevant derivations from the normal mendelian inheritance. IL-20R2−/− mice bred and developed normally, without signs of inflammation under normal housing conditions. Histologically, all mice were without pathological abnormalities. Older mice (up to 1 year) are healthy and do not develop tumors. We analyzed the lymphoid cells of spleen, inguinal lymph nodes, nonparenchymal cells from liver, and Peyer’s patches by FACS analysis. Absolute numbers of T, NK, NKT, and B cells were comparable between IL-20R2−/− and congenic IL-20R2+/+ or IL-20R2+/− mouse strains. We observed no differences in surface markers of immune cells isolated from wild-type and IL-20R2−/− mice. Thus, T and B cell development is normal in IL-20R2 knockout mice. There was also no difference in cell numbers and distribution of APCs (DCs, macrophages) between both mouse strains. The cytokines IL-19, IL-20, and IL-24 are expressed in T cells (3, 5), but their action on lympho- or myeloid cells has not been conclusively shown to date. Signaling of all three cytokines is abolished in cells from IL-20R2−/− mice. We therefore tested whether IL-20R2 deficiency influences the activation of spleen cell cultures (containing APC and T cells) by anti-CD3/CD28 and Con A.
Single-cell suspensions of spleens from IL-20R2+/− or IL-20R2−/− genotype were prepared. After polyclonal stimulation with Con A or anti-CD3/CD28 beads, spleen cell cultures of IL-20R2−/− mice showed higher IFN-γ and IL-2 cytokine secretion (Fig. 2⇓, A and B). 3H incorporation was used to measure proliferation after activation of spleen cells by anti-CD3/CD28 beads or Con A. Stimulated IL-20R2−/− spleen cell cultures showed better proliferation responses than IL-20R2+/− cultures (Fig. 2⇓C; only bead activation shown). IL-20R2 signaling regulates growth response and cytokine production of activated spleen cell cultures in vitro. Isolated spleen cells were cultured at a density of 1 × 106 cells/ml. Con A (A) was added for the indicated time points. Anti-CD3/CD28 beads (B) were added for 18 h. Cytokine production was determined in cell culture supernatants by ELISA. C, Anti-CD3/CD28 bead stimulation-induced growth response of spleen cell cultures was measured by [3H]thymidine uptake. Bars represent mean ± SD (n = 4) of one of three similar experiments. To examine whether IL-19, IL-20, or IL-24 acts on APCs or on T cells, experiments were repeated with purified CD4 and CD8 cells from IL-20R2−/− and IL-20R2+/− mice. 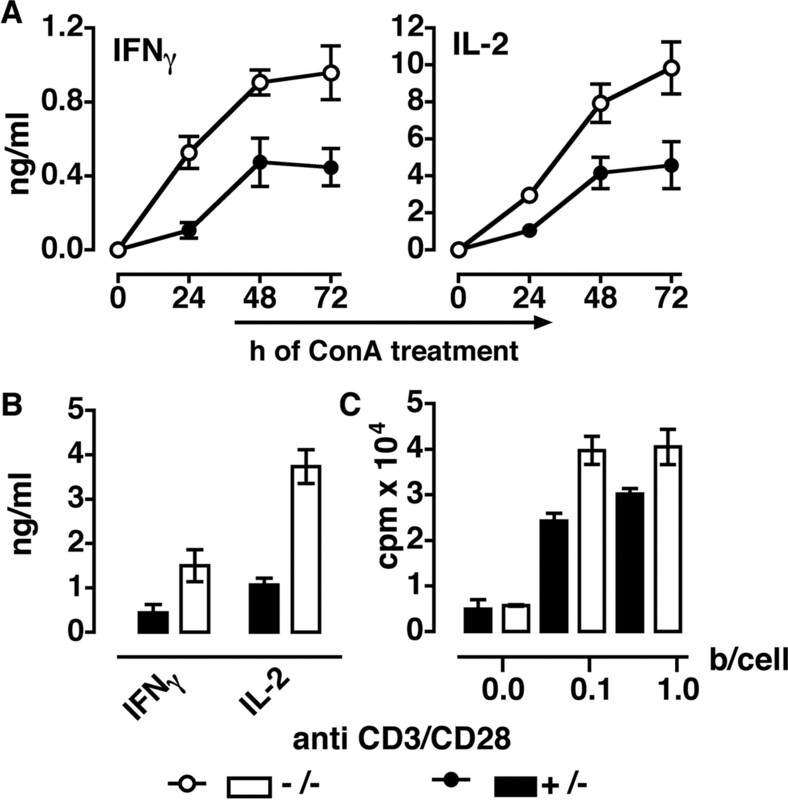 Purified CD8 cells from knockout animals secreted more IFN-γ and IL-2 after anti-CD3/CD28 activation (Fig. 3⇓A). IL-20R2-deficient CD8 cells showed higher proliferation responses than T cells from control animals (Fig. 3⇓B). 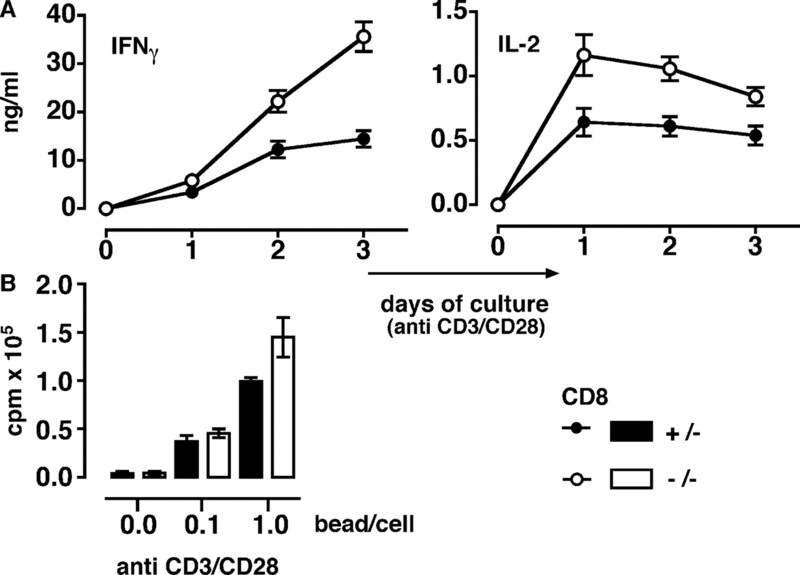 Anti-CD3/CD28 bead-activated IL-20R2−/− CD4 cells also produced more IL-2 and IFN-γ than control CD4 cells (Fig. 4⇓A). 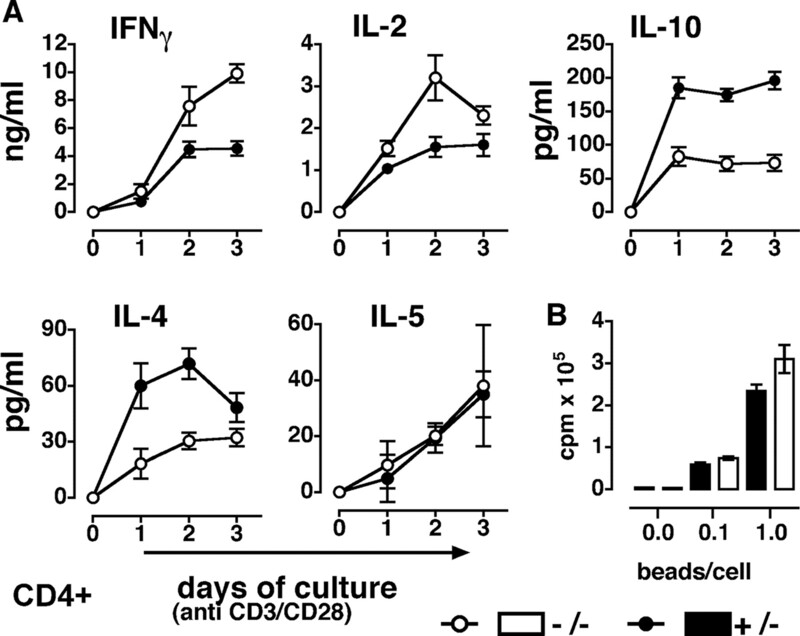 In addition, bead-activated IL-20R2−/− CD4 cells secreted less IL-10 and IL-4 compared with stimulated IL-20R2+/− CD4 cells (Fig. 4⇓A). Quantification of culture supernatants from activated CD4 cells for secretion of the Th2 cytokine IL-5 revealed no difference between both mouse strains. IL-13 was not detectable in culture supernatants of activated IL-20R2+/+ or IL-20R2−/− CD4 T and CD8 T cells (data not shown). The IL-20R2-deficient CD4 cells showed higher proliferation responses than T cells from control animals, as judged by 3H incorporation assay (Fig. 4⇓B). FACS analysis (Table II⇓) of IL-20R2+/+ or IL-20R2−/− T cells after 3 days of culture shows that cell numbers as well as the proportion of IFN-γ- and IL-2-positive CD4 and CD8 cells are higher in IL-20R2−/− than in IL-20R2+/+ T cell cultures. We found that addition of murine IL (mIL)-20 (≥250 ng) was sufficient to repress the IFN-γ secretion of wild-type CD8 and CD4 T cells that were submaximally stimulated (i.e., <0.5 anti-CD3/CD28 bead/cell; supplementary data5 Fig. 1⇑). In summary, these data suggest that the enhanced activation of IL-20R2-deficient T cells is intrinsic to the T cell population and may be independent of APC. IL-20R2 regulates cytokine expression and growth response of stimulated CD8 cells. A, CD8 T cells were isolated from IL-20R2−/− or IL-20R2+/− spleen cells by MACS. Cells were cultured at a density of 1 × 106 cells/ml and activated with anti-CD3/CD28 beads (1 bead/cell). At the indicated time points, cytokine concentration was measured by ELISA in cell culture supernatants. B, Anti-CD3/CD28-induced growth response of spleen cell cultures was measured by [3H]thymidine uptake. Bars represent mean ± SD (n = 4) of one of three similar experiments. IL-20R2 regulates cytokine expression and growth response of stimulated CD4 cells. A, CD4 T cells were isolated from IL-20R2−/− or IL-20R2+/− spleen cells by MACS. Cells were cultured at a density of 1 × 106 cells/ml and activated with anti-CD3/CD28 beads (1 bead/cell). At the indicated time points, cytokine concentration was measured by ELISA in cell culture supernatants. Bars represent mean ± SD (n = 4) of one of three similar experiments. B, MACS-purified CD4 cells (1 × 106 cells/ml) were anti-CD3/CD28 stimulated. Anti-CD3/CD28-induced growth response of spleen cell cultures was measured by [3H]thymidine uptake. Bars represent mean ± SD (n = 4) of one of three similar experiments. A representative (of three independent) experiment(s) is shown. We therefore analyzed Ag-dependent T cell priming of IL-20R2+/−- and IL-20R2-deficient DCs. Peptide-pulsed DCs of IL-20R2−/− and IL-20R2+/− genotypes were cocultured with naive OT I-RAG−/− (CD8) (Fig. 5⇓A) or OT II-RAG−/− (CD4) T cells (Fig. 5⇓B). Ag-specific priming of T cells by IL-20R2−/− and IL-20R2+/− DCs. T cells were isolated from spleens of OT I-RAG−/− (CD8 T cells) or OT II-RAG−/− (CD4 T cells). CD11c+B220− DCs were isolated from spleens of IL-20R2+/− or IL-20R2−/− mice by MACS. DCs were pulsed with Kb-binding OVA257–264 SIINFEKL recognized by OT I CD8 T cells or Ab-binding OVA323–339 ISQAVHAAHAEINEAGR recognized by OT II CD4 T cells for 4 h. A total of 1 × 104 pulsed and washed DCs was cocultured with 1 × 105 MACS-purified T cells from OT I-RAG−/− (A) or OT II-RAG−/− (B) TCR transgenic mice. At the indicated time points, cytokine concentration was measured in cell culture supernatants by ELISA. T cells activated by DCs of wild-type or knockout animals showed no difference in IFN-γ, IL-12p40 (Fig. 5⇑), and IL-10 (data not shown) cytokine secretion. These results confirm that IL-20R2 signaling most likely down-regulates CD8 and CD4 T cell answers directly. Ag presentation and T cell stimulation by DCs are not influenced by IL-20R2 signaling. Our in vitro results suggest that IL-20R2 signaling might have a suppressive effect on CD8 and possibly down-regulate Th1-like adaptive immune responses. DNA vaccines can effectively prime CD8 responses. The pCI/HBsAg (encoding hepatitis S-Antigen) and pCI/OVA (encoding OVA) expression systems are well-established DNA vaccines to study the priming of T cells under aseptic conditions and without the help of an adjuvant. To test whether IL-20R2 signaling inhibits CD8 T cell responses in vivo, IL-20R2+/+, IL-20R2+/−, and IL-20R2−/− mice were i.m. challenged with these DNA vaccines. Equal absolute numbers of CD8 and CD4 T cells were recovered from pCI/HBsAg and pCI/OVA DNA-immunized IL-20R2 knockout and control animals. Numbers of specifically primed tetramer-positive CD8 T cells and the frequency of Ag-specific IFN-γ-producing CD8 T cells were higher in IL-20R2−/− mice than in control groups (Fig. 6⇓, A and B). Thus, IL-19, IL-20, and IL-24 down-modulate CD8 responses to DNA vaccines in vivo, and this effect is not restricted to a single type of Ag. Furthermore, elevated CD8 responses in immunized IL-20R2−/− mice were independent of Ag amount or vaccination route. Intradermal application (gene gun) of low amounts of pCI/S DNA Ag in mice also generated higher Ag-specific CD8 responses in IL-20R2−/− mice than in wild-type mice (data not shown). Ag-specific CD8 and CD4 T cell responses to pCI/S and pCI/OVA vaccines in IL-20R2−/− and IL-20R2+/− mice. Mice were immunized with 50 μg (1 μg/ml) of pCI/S DNA vaccine (encoding HBsAg) into each tibialis muscle (100 μg of plasmid/mouse). Twelve days postimmunization, spleens were isolated. Freshly isolated cells were stained with Kb/S190–197 tetramers and anti-CD8 mAb to detect specific CD8 T cells reactive to HBsAg (A, left). Freshly isolated cells were ex vivo restimulated for 4 h with Kb/S190–197 in the presence of BFA and stained with Abs for intracellular IFN-γ and anti-CD8 mAb (A, right). A second group of mice was immunized with 50 μg of pCI/OVA DNA vaccine (encoding the complete OVA Ag) into each tibialis muscle. Freshly isolated cells were stained with H2kb257–264-SIINFEKL tetramers and anti-CD8 mAb to detect OVA-specific CD8 T cells by FACS (B). Mean values (±SD) of three mice per group are shown. The numbers of Ag-primed, specific CD8 IFN-γ+/105 CD8 T cells of three mice analyzed by FACS analyses are shown (mean ± SD). The experiments were repeated three times with similar results. C, Mice were immunized with 50 μg of pCI/S DNA vaccine (encoding HBsAg) into each tibialis muscle. Twelve days postimmunization, spleens were isolated. Freshly isolated cells were restimulated with S-particel. After 20 h, BFA was added. CD4 IFN-γ+ T cells were analyzed by FACS. Mean values (±SD) of three mice per group are shown. The experiment was repeated three times with similar results. FACS analysis was gated on live CD4 or CD8 T cells. Next, CD4 cells from (i.d. or i.m.) vaccinated IL-20R2−/− and IL-20R2+/− animals were analyzed. In comparison with control mice, higher levels of IFN-γ-positive CD4 cells/total CD4 cells (Fig. 6⇑C) were recovered from immunized IL-20R2−/− mice. In addition, Ag-restimulated IL-20R2−/− CD4 cells produced less IL-10 than wild-type CD4 cells (data not shown). Hence, the in vitro results confirmed our in vitro observations. We next analyzed the kinetics of CD8 primary response to vaccine and the memory response to Ag in IL-20R2+/− and IL-20R2−/− mice. Mice (n = 15) were vaccinated i.m. with pCI/S, and the generation of Ag-specific CD8 cells was analyzed by FACS at the indicated time points (Fig. 7⇓). A group of these mice received a second injection of pCI/S at day 30 (boost). 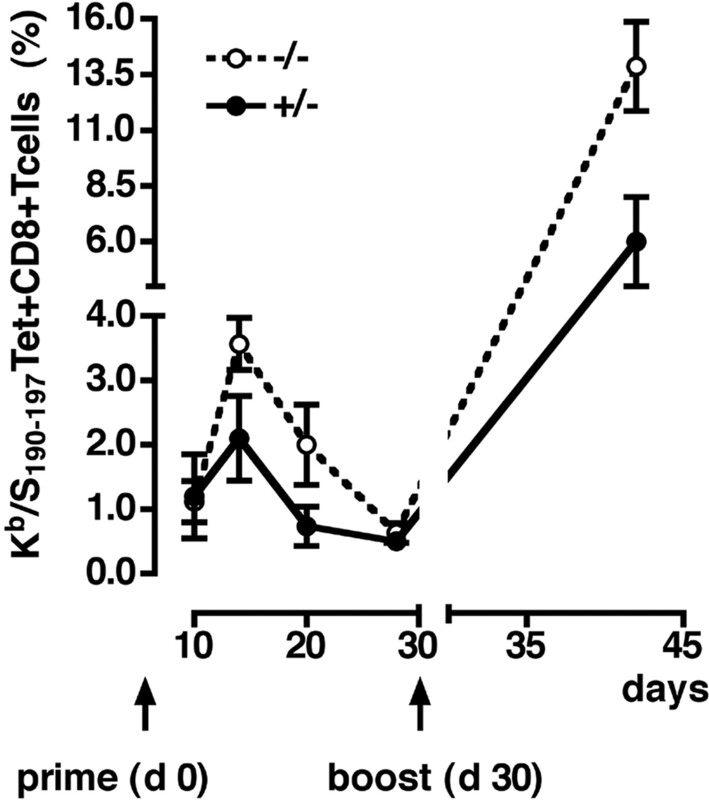 Twelve days after boost, total (tetramer) Ag-specific CD8 T cell numbers were analyzed. The secondary CD8 response to Ag was 2- to 3-fold higher in knockout animals than in heterozygous littermates. The time course shows that CD8 cells were activated with similar kinetics in IL-20R2−/− and IL-20R2+/− mouse strains (Fig. 7⇓). The highest CD8 frequencies were detectable at ∼day 12–14 postvaccination, and specifically activated CD8 cells contracted until day 30 to similar levels in both mouse strains. This suggests that IL-20R2 enhances the primary and secondary response of CD8 cells to Ag, but it does not influence the kinetics of Ag-specific T cell activation, expansion, and subsequent contraction. Thus, the higher memory response in IL-20R2-deficient mice was not due to a longer persistence of CD8 T cells after primary activation. Time course of Ag-dependent CD8 activation and memory responses in IL-20R2−/− mice. Mice (n = 15) were immunized with 50 μg (1 μg/ml) of pCI/S DNA vaccine (encoding HBsAg) into each tibialis muscle. Thirty days after first vaccination, a group of mice was boosted with pCI/S and analyzed 12 days later. At the indicated time points postimmunization, freshly isolated cells were stained to detect specific CD8 T cells with Kb/S190–197 tetramers exactly as described in Fig. 6⇑. Mean values (±SD) of three mice per time point are shown. The experiment was repeated twice with identical results. Sensitization against TNCB is an established murine model to study allergic contact dermatitis. We chose the CHS model to analyze the reaction of IL-20R2−/− mice, because CHS against TNCB depends on the Ag-specific activation of T cells, particularly of CD8 cells (31). IL-20R2−/− and heterozygous control mice (on BALB/c background, generation 7) were sensitized against the contact allergen TNCB. 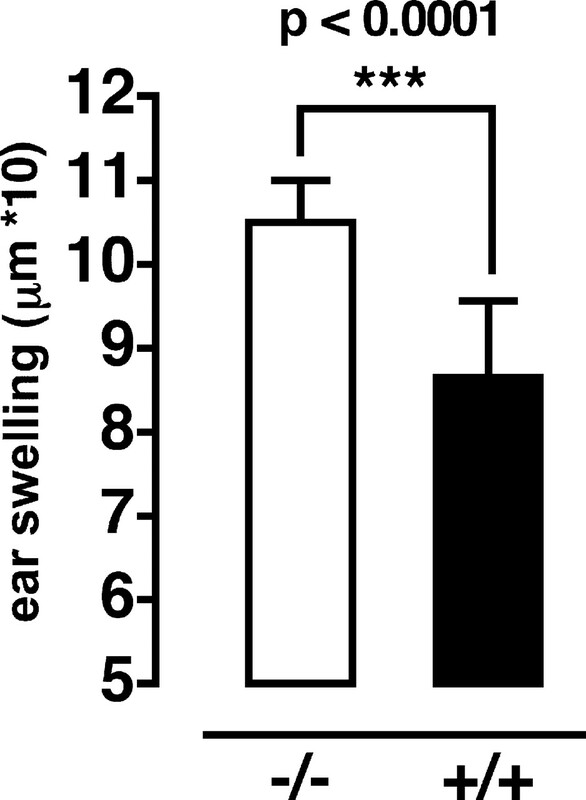 When challenged with TNCB, IL-20R2-deficient mice showed significantly increased ear-swelling response (n = 8) compared with IL-20R2+/− (Fig. 8⇓). Thus, in vivo signaling of IL-19, IL-20, or IL-24 is important to attenuate the CHS against TNCB. IL-20R2 down-regulates CHS reaction to TNCB. BALB/c IL-20R2-deficient mice or wild-type littermates were painted on their abdominal skin with TNCB at day 0. Mice were rechallenged by painting with TNCB on both sides of the ears on day 5. Ear thickness from left and right ears was measured with an engineer’s micrometer (Mitutoyo) before and 24 h after challenge, and ear swelling was calculated. The experiment was repeated three times with eight mice per group. Values represent mean ± SD. Our in vitro results support Th2-promoting properties of IL-20R2. The finding of reduced production of IL-4 and IL-10, coupled with increased secretion of IFN-γ, would suggest that the IL-20R2-deficient mice may have a problem in mounting a Th2-type Ab response and in isotype switching of Ab responses. We first analyzed basal Ig isotype concentrations in IL-20R2−/− and IL-20R2+/+ littermates (Fig. 9⇓). We found no alterations in IgA, IgM IgG2a, IgG2b, and IgG3 levels in C57BL/6 or BALB/c mice of IL-20R2−/− and IL-20R2+/+ genotypes. Basal IgE serum levels of knockout and wild-type mice (n = 12) were also comparable. We next tested whether the induction of IgE is impaired in IL-20R2-deficient mice. IL-20R2−/− and normal littermates (n = 4) were i.p. injected with 200 μg of goat anti-mouse IgD that induces IgE (32). Five days after injection, IgE levels of goat anti-mouse IgD-treated knockout mice were as high as in wild-type animals (ELISA, ≈800–1000 ng/ml; data not shown). Thus, there is no general defect of IgE production in IL-20R2-deficient mice. Basal expression of IgG isotypes in IL-20R2−/− and IL-20R2+/+ mice. Sera were collected from 12–15 IL-20R2−/− and IL-20R2+/+ animals of C57BL/6 background (generation 10). For the quantification of Ig subtypes, suspension arrays based on xMAP technology were conducted in principle, as described (26 ). IL-20R2−/− and IL-20R2+/+ of BALB/c background (generation 12) were analyzed for IgG2a. IgG2a baseline levels were comparable between both mouse strains (data not shown). All xMAP assay measurements were conducted for a minimum of 100 beads per isotype. In addition, IgE levels determined by xMAP assays were verified by a conventional ELISA (BioLegend). One dot represents data from one animal. Bars are set at mean values of each group. Statistical significance of differences in Ig concentrations was analyzed using the Mann-Whitney U test. Values of p < 0.05 (∗) were considered statistically significant. In some experiments (n = 14–16, C57BL/6 backgound), IgG1 basal serum levels were moderately higher in IL-20R2−/− mice. We therefore tested in vivo whether the Ab response to Ag is shifted toward a Th1-like isotype response in knockout mice. During Th2-like immune reactions, a lower IgG2a/IgG1 isotype ratio of Ag-specific Abs is generated than in Th1-polarized immune answers (27). The specific Ab response to HBsAg after vaccination with pCI/S was analyzed in IL-20R2−/− and IL-20R2+/+ littermates. The IgG2a/IgG1 ratio was not changed in knockout mice when compared with vaccinated wild-type littermates (data not shown). With Th2 (i.d., gene gun)-directed vaccination strategies (27) that generate high amounts of IgG1 relative to IgG2a, comparable IgG2a/IgG1 serum responses were mounted in both mouse strains (BALB/c background). Thus, the immune system is not shifted toward a more Th1-like Ab isoprofile (i.e., higher IgG2a/IgG1 ratio) in IL-20R2−/− mice under noninflammatory conditions used in this study. The new IL-10-type cytokines IL-19, IL-20, IL-22, and IL-24 seem to be involved in diseases that are correlated with pathological changes within the immune system (9, 14, 18, 33). Nevertheless, it is still controversial whether lymphocytes are targets for IL-19, IL-20, or IL-24. We therefore generated a knockout mouse strain deficient for IL-20R2. Analysis of the immune system of IL-20R2−/− mice gave no hints of defects in T cell development, but significant functional differences between normal and IL-20R2−/− T cells became evident after polyclonal activation in vitro and Ag-dependent activation in vivo. These results provide strong evidence that IL-20R2 signaling directly influences T cell responses in vivo and in vitro. 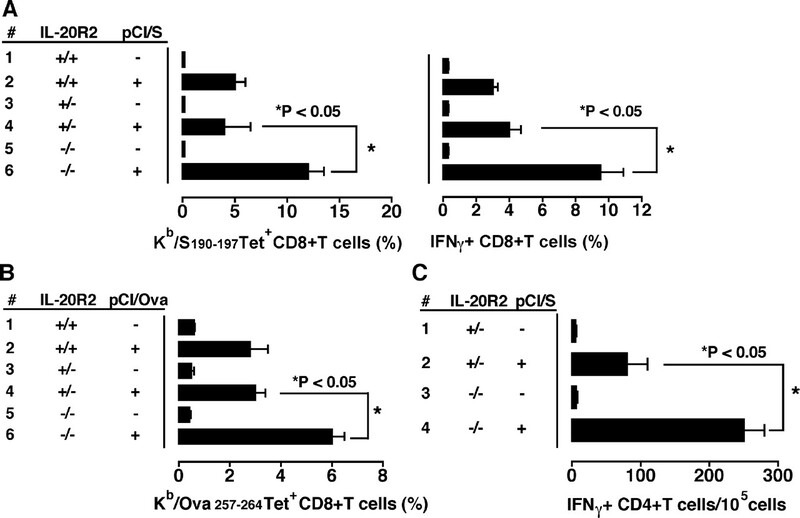 In vitro stimulated IL-20R2-deficient T cells produce more IL-2 and IFN-γ than IL-20R2+/− cells. Consistent with the elevated secretion of IL-2, IL-20R2−/− CD8 T cells proliferated at higher rates. Complementary gene expression of marker cytokines for Th2-polarized CD4 T cells (IL-4, IL-10) was lower in IL-20R2−/− T cells. Our in vitro results suggest that signals generated by IL-20R2 down-regulate CD8 activation and Th1-like immune responses of CD4 T cells. DNA vaccinations prime CD8 answers without the need of adjuvants and inflammation (34). We chose this model to evaluate the effects of IL-20R2 signaling on CD8 responses in vivo. As expected, we detected significantly higher numbers of Ag-specific CD8 cells in IL-20R2-deficient mice. Further support for enhanced activation of Ag-specific CD8 cells in IL-20R2−/− mice came from analysis of a murine model of contact dermatitis to TNCB. The hypersensitivity reaction to TNCB depends on activated CD8 T cells (31) and was significantly enhanced in IL-20R2-deficient mice. The number and surface phenotype of CD8, CD4, NK, and NKT cells in IL-20R2−/− mice were undistinguishable from that of wild-type mice. After immunization, the total number of CD4 and CD8 T cells was also comparable between IL-20R2−/− and IL-20R+/− mice. Thus, it is unlikely that the enhanced Ag-specific CD8 response in IL-20R2−/− mice is due to expanded populations of T cells. We also ruled out that clearance of CD8 cells is inhibited in IL-20R2−/− mice. After vaccination, CD8 cell activation, expansion, and contraction followed the same time course in IL-20R2−/− and IL-20R2+/− mice. Maturing human DCs were recently shown to be a source of IL-20 after LPS stimulation (35), and may strengthen innate responses of epithelial cells. rIL-19 was reported to stimulate IL-10 production in human DCs and to enhance the development of IL-10-producing DC in an in vitro model of DC differentiation (18). The influence of IL-19, IL-20, or IL-24 on Ag-presenting DCs during specific priming of T cells has not been investigated to date. In our hands, Ag-loaded DCs from IL-20R2+/− or IL-20R2−/− mice did not influence the secretion of IL-10, IFN-γ, and IL-12p40 during specific activation of IL-20R2+/+ (OT I or OT II) T cells. Thus, we can exclude that IL-20R2 signaling in DCs has a regulatory function in specific priming of T cells. In addition to enhanced CD8 activation in IL-20R2−/− mice, cytokine responses of CD4 T cells were also influenced by IL-20R2. 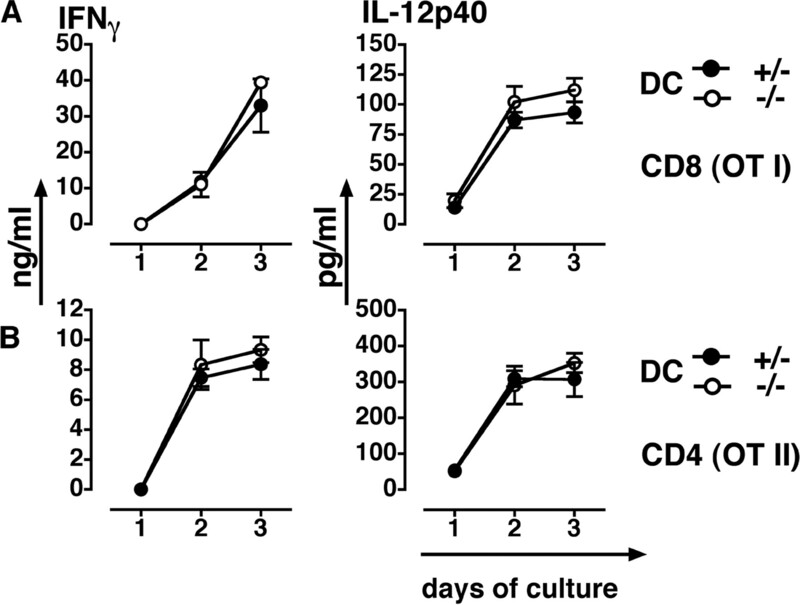 After activation, IL-20R2−/− CD4 cells produced less IL-10 and more IFN-γ than wild-type CD4 cells in vitro. Consistent with this observation, Ag-specific CD4 cells of vaccinated IL-20R2−/− mice expressed less IL-10 and more IFN-γ than CD4 cells of control animals. Enhanced Ag-specific CD8 answers after DNA vaccination were previously observed in mice unresponsive to IFN type I (IFNαβ receptor−/−) (25). In contrast to our results, T cell responses were influenced by the genotype of DCs in this model. IL-10 secretion of naive OT II CD4 cells was suppressed, and IFN-γ secretion was enhanced by Ag-loaded IFNαβ receptor−/− DC. Thus, we believe that IL-20R2 signaling down-regulates CD8 T cell responses through other mechanisms than type I IFN receptors. It has recently been shown that CD8 cells lacking IL-10R2 expression undergo enhanced (2- to 3-fold) primary and secondary expansion following Listeria monocytogenes infection (36). This effect was independent of APCs. Furthermore, it has been reported that IL-10 mediates self-control of Th1 cell expansion after infections with different pathogens (37, 38). Conventional T-bet+ Foxp3− Th1 CD4 cells are the major source of host-protective IL-10 in these settings. Like IL-10, IL-19, IL-20, and IL-24 may dampen the first rounds of CD8 cell expansion to avoid uncontrolled T cell responses. Our results clearly show that IL-19, IL-20, and IL-24 act directly on T cells. In vivo, it remains to be shown whether they suppress CD8 T cell answers also indirectly by enhancing the secretion of IL-10 in CD4 cells. The contribution of CD4 cells to the enhanced priming of CD8 responses is currently under intensive investigation. It has been reported previously that rIL-19 and rIL-20 polarize naive T cells toward a Th2 phenotype after several rounds of stimulation in vitro (17). IL-24 is up-regulated in Th2-polarized lymphocyte preparations (19, 20). rIL-19 enhances the induction of Th2 cytokines in a murine asthma model (14, 39). In vivo, a shift of Th1 to Th2 answers results in switching of the IgG isotype to higher IgG1/IgG2a ratios (27). Our in vitro results support Th2-promoting properties of IL-20R2, but vaccinated IL-20R2−/− mice developed the same Ab isotype profiles as their IL-20R2+/− littermates. Vice versa, Th1 (i.m. )- or Th2 (i.d. )-directed vaccination strategies (27) did not influence the enhanced Ag-specific priming of CD8 T cells in IL-20R2−/− mice. Thus, in vivo IL-20R2 signaling enhances CD8 priming, but does not alter the polarization of the immune response at least under noninfectious vaccination conditions. Further investigations will show whether this is also the case in infectious mouse models that cause a stronger polarization of the immune response, e.g., like Leishmania or Helminthes infections. During the course of this study, two other groups published IL-20R2-deficient mice. Chan et al. (10) used IL-20R2−/− mice in a model of IL-23-induced psoriasis. They reported that epidermal hyperplasia is reduced in IL-20R2−/− mice. In contrast to human psoriasis, the IL-23-induced psoriatic lesions do not contain CD8 cells (10). We have shown in this study that T cell activation is down-regulated by IL-20R2. Hence, we provide evidence for an additional mechanism regarding how IL-19, IL-20, or IL-24 might contribute to the outcome of this disease. Mouse models that include activation of CD8 responses are necessary to evaluate the contribution of IL-20R2 to the outcome of psoriasis. The enhanced hypersensitivity reaction to TNCB in IL-20R2−/− mice already shows that IL-20R2 signaling has an impact on T cell-dependent reactions in the skin. A second group (23) reported that IL-20R2 signaling is dispensable for survival of Clostridium rodentium infections. IL-20R2−/− mice had survival rates comparable to wild-type littermates, although IL-19, IL-20, and IL-24 are up-regulated in colons of inoculated mice during the first 8 h of infection. The authors clearly show that innate defense mechanisms are important for the outcome of the disease. They provide strong evidence that IL-22, and not IL-19, IL-20, or IL-24, has an important role in this process. Their investigations support other findings (21, 22, 40), which also demonstrate that IL-22 regulates innate immune responses of epithelial cells and does not act on T cells. Summarizing the above, we believe that biological activities of IL-19, IL-20, and IL-24 are distinct from IL-22. In contrast to IL-22, they seem to have immune regulatory rather than (pro-) inflammatory functions. Like IL-22, IL-20 and IL-24 can recruit the IL-22R chain (IL-20R type II receptor) as α-chain (3, 15). In addition, they can also signal through a different receptor heterodimer (IL-20R1/IL-20R2) that is not bound by IL-22 (3, 15). The different action of the IL-10-type cytokines might be regulated by expression of the individual α- or β-receptor chains. Which receptor heterodimer (IL-20R2 type I or type II) signals in T cells awaits an analysis of (double) knockouts of IL-20R1 and IL-22R. To analyze the mechanisms that underlie the skewed immune responses of IL-20R2-deficient mice, IL-20R2−/− and IL-20R2+/− cells were stimulated in vitro with rIL-20. mIL-20 did repress IFN-γ secretion when T cells were not maximally activated, but had no effect on maximally stimulated T cells. One reason for this might be the low bioreactivity of mIL-20. Even at high concentrations (≈250 ng/ml), the mIL-20-induced STAT3-PY signal was weak in comparison with mIL-22 or mIL-10. IL-4 and IL-10 were not detectable under these conditions. Thus, IL-20 (or IL-19, IL-24) possibly suppresses T cells at early time points of T cell activation, and this effect is neutralized by cytokines induced under cell culture conditions with maximally activated T cells. Addition of IL-20 to IL-20R2+/− T cell cultures was not sufficient to increase the production of IL-4 and IL-10 above the detection limit of the ELISA. The second reason could be that IL-24 or IL-19, which signals via IL-20R type I, might be responsible for the repression of T cells. In our hands, mIL-19 did not induce STAT3 phosphorylation in cells with endogenous receptor levels, e.g., primary cultures of epithelial skin cells or after s.c. injection in mice. Thus, we could not determine whether IL-20, which binds to both types of IL-20R, or IL-19, which binds only to IL-20R type I, has redundant or different effects on T cells. Our in vivo and in vitro data suggest that IL-19, IL-20, and IL-24 suppress CD4/CD8 T cell responses during priming. They might prepare T cells to aquire Th2-like functions, which may then be sustained by other factors (e.g., IL-4). Because active mIL-19 and IL-24 are not available and the bioreactivity of mIL-20 seems to be low, a detailed analysis of the underlying mechanisms is not possible at the moment. CD8 T cell responses are especially important for the effective clearance of viruses such as hepatitis B virus, and are necessary to prevent and resolve the development of chronic hepatitis. The regulation of Ag-specific CD8 responses is therefore of major therapeutic interest (41, 42, 43, 44). In summary, we could show that IL-20R2 regulates T cell activation directly and attenuates Ag-specific CD8 responses. It is tempting to speculate that IL-19, IL-20, and IL-24 have IL-10-like anti-inflammatory activities and might be useful to down-regulate overwhelming immune reactions in chronic diseases. We thank K. Diepold (Ulm) for excellent technical assistance, and Maria Ebel and Anke Samuels (Braunschweig) for technical assistance during the gene-targeting procedure. We thank H. J. Fehling (Department of Immunology, University of Ulm) for helpful discussions and the pcrXGTK target vector. 1 This work was supported by a grant from Deutsche Forschungsgemeinschaft (DFG WE 3550/3-1) to U.M.W. and a DFG grant to F.O. (SFB 518/A18). Funding for W.M. was via Nationales Genomforschungsnetz. 2 Current address: Bill Ford Chair in Cellular Immunology, University of Manchester, Faculty of Life Sciences, Manchester, U.K.
4 Abbreviations used in this paper: DC, dendritic cell; BFA, brefeldin A; CHS, contact hypersensitivity; ES, embryonic stem; FCM, flow cytometry; HBsAg, hepatitis B surface Ag; i.d., intradermal; mIL, murine IL; TNCB, trinitro-chloro-benzene. 5 The online version of this article contains supplementary material. Fickenscher, H., S. Hör, H. Küpers, A. Knappe, S. Wittmann, H. Sticht. 2002. The interleukin-10 family of cytokines. Trends Immunol. 23: 89-96. Kotenko, S. V., L. S. Izotova, O. V. Mirochnitchenko, E. Esterova, H. Dickensheets, R. P. Donnelly, S. Pestka. 2001. Identification of the functional interleukin-22 (IL-22) receptor complex: the IL-10R2 chain (IL-10Rb) is a common chain of both the IL-10 and IL-22 (IL-10-related T cell-derived inducible factor, IL-TIF) receptor complexes. J. Biol. Chem. 276: 2725-2732. Renauld, J. C.. 2003. Class II cytokine receptors and their ligands: key antiviral and inflammatory modulators. Nat. Rev. Immunol. 8: 667-676. Dumoutier, L., C. Leemans, D. Lejeune, S. V. Kotenko, J. C. Renauld. 2001. STAT activation by IL-19, IL-20 and mda-7 through IL-20 receptor complexes of two types. J. Immunol. 167: 3545-3549. Wolk, K., S. Kunz, K. Asadullah, R. Sabat. 2002. Cutting edge: immune cells as sources and targets of the IL-10 family members?. J. Immunol. 168: 5397-5402. Kunz, S., K. Wolk, E. Witte, K. Witte, W. D. Doecke, H. D. Volk, W. Sterry, K. Asadullah, R. Sabat. 2006. Interleukin (IL)-19, IL-20 and IL-24 are produced by and act on keratinocytes and are distinct from classical ILs. Exp. Dermatol. 15: 991-1004. Sa, S. M., P. A. Valdez, J. Wu, K. Jung, F. Zhong, L. Hall, I. Kasman, J. Winer, Z. Modrusan, D. M. Danilenko, W. Ouyang. 2007. The effects of IL-20 subfamily cytokines on reconstituted human epidermis suggest potential roles in cutaneous innate defense and pathogenic adaptive immunity in psoriasis. J. Immunol. 178: 2229-2240. Wang, F., E. Lee, M. A. Lowes, A. S. Haider, J. Fuentes-Duculan, M. V. Abello, F. Chamian, I. Cardinale, J. G. Krueger. 2006. Prominent production of IL-20 by CD68+/CD11c+ myeloid-derived cells in psoriasis: gene regulation and cellular effects. J. Invest. Dermatol. 126: 1590-1599. Blumberg, H., D. Conklin, W. F. Xu, A. Grossmann, T. Brender, S. Carollo, M. Eagan, D. Foster, B. A. Haldeman, A. Hammond, et al 2001. Interleukin 20: discovery, receptor identification, and role in epidermal function. Cell 104: 9-19. Chan, J. R., W. Blumenschein, E. Murphy, C. Diveu, M. Wiekowski, S. Abbondanzo, L. Lucian, R. Geissler, S. Brodie, A. B. Kimball, et al 2006. IL-23 stimulates epidermal hyperplasia via TNF and IL-20R2-dependent mechanisms with implications for psoriasis pathogenesis. J. Exp. Med. 203: 2577-2587. Hsu, Y. H., H. H. Li, M. Y. Hsieh, M. F. Liu, K. Y. Huang, L. S. Chin, P. C. Chen, H. H. Cheng, M. S. Chang. 2006. Function of interleukin-20 as a proinflammatory molecule in rheumatoid and experimental arthritis. Arthritis Rheum. 54: 2722-2733. Hsieh, M. Y., W. Y. Chen, M. J. Jiang, B. C. Cheng, T. Y. Huang, M. S. Chang. 2006. Interleukin-20 promotes angiogenesis in a direct and indirect manner. Genes Immunol. 7: 234-242. Wei, C. C., Y. H. Hsu, H. H. Li, Y. C. Wang, M. Y. Hsieh, W. Y. Chen, C. H. Hsing, M. S. Chang. 2006. IL-20: biological functions and clinical implications. J. Biomed. Sci. 13: 601-612. Liao, S. C., Y. C. Cheng, Y. C. Wang, C. W. Wang, S. M. Yang, C. K. Yu, C. C. Shieh, K. C. Cheng, M. F. Lee, S. R. Chiang, et al 2004. IL-19 induced Th2 cytokines and was up-regulated in asthma patients. J. Immunol. 173: 6712-6718. Parrish-Novak, J., W. Xu, T. Brender, L. Yao, C. Jones, J. West, C. Brandt, L. Jelinek, K. Madden, P. A. McKernan, et al 2002. Interleukins 19, 20, and 24 signal through two distinct receptor complexes: differences in receptor-ligand interactions mediate unique biological functions. J. Biol. Chem. 277: 47517-47523. Oral, H. B., S. V. Kotenko, M. Yilmaz, O. Mani, J. Zumkehr, K. Blaser, C. A. Akdis, M. Akdis. 2006. Regulation of T cells and cytokines by the interleukin-10 (IL-10)-family cytokines IL-19, IL-20, IL-22, IL-24 and IL-26. Eur. J. Immunol. 36: 380-388. Jordan, W. J., J. Eskdale, M. Boniotto, G. P. Lennon, J. Peat, J. D. Campbell, G. Gallagher. 2005. 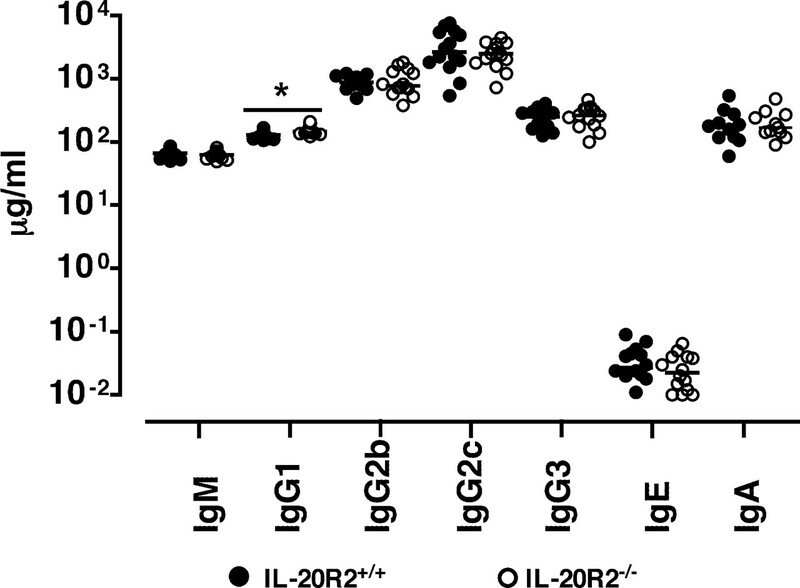 Human IL-19 regulates immunity through auto-induction of IL-19 and production of IL-10. Eur. J. Immunol. 35: 1576-1582. Schaefer, G., C. Venkataraman, U. Schindler. 2001. Cutting edge: FISP (IL-4-induced secreted protein), a novel cytokine-like molecule secreted by Th2 cells. J. Immunol. 166: 5859-5863. Gallagher, G., J. Eskdale, W. Jordan, J. Peat, J. Campbell, M. Boniotto, G. P. Lennon, H. Dickensheets, R. P. Donnelly. 2004. Human interleukin-19 and its receptor: a potential role in the induction of Th2 responses. Int. Immunopharmacol. 4: 615-626. Wolk, K., S. Kunz, E. Witte, M. Friedrich, K. Asadullah, R. Sabat. 2004. IL-22 increases the innate immunity of tissues. Immunity 21: 241-254. Wolk, K., E. Witte, E. Wallace, W. D. Docke, S. Kunz, K. Asadullah, H. D. Volk, W. Sterry, R. Sabat. 2006. IL-22 regulates the expression of genes responsible for antimicrobial defense, cellular differentiation, and mobility in keratinocytes: a potential role in psoriasis. Eur. J. Immunol. 36: 1309-1323. Zheng, Y., P. A. Valdez, D. M. Danilenko, Y. Hu, S. M. Sa, Q. Gong, A. R. Abbas, Z. Modrusan, N. Ghilardi, F. J. de Sauvage, W. Ouyang. 2008. Interleukin-22 mediates early host defense against attaching and effacing bacterial pathogens. Nat. Med. 14: 282-289. Wegenka, U. M., N. Dikopoulos, J. Reimann, G. Adler, C. Wahl. 2007. The murine liver is a potential target organ for IL-19, IL-20 and IL-24: type I interferons and LPS regulate the expression of IL-20R2. J. Hepatol. 46: 257-265. Dikopoulos, N., A. Bertoletti, A. Kröger, H. Hauser, R. Schirmbeck, J. Reimann. 2005. Type I IFN negatively regulates CD8+ T cell responses through IL-10-producing CD4+ T regulatory 1 cells. J. Immunol. 174: 99-109. Schippers, A., S. Mateika, B. Prochnow, A. D. Gruber, W. Müller, U. Frischmann. 2008. Susceptibility of four inbred mouse strains to a low-pathogenic isolate of Yersinia enterocolitica. Mamm. Genome 19: 279-291. Schirmbeck, R., J. Wild, D. Stober, H. E. Blum, F. V. Chisari, M. Geissler, J. Reimann. 2000. Ongoing murine T1 or T2 immune responses to the hepatitis B surface antigen are excluded from the liver that expresses transgene-encoded hepatitis B surface antigen. J. Immunol. 164: 4235-4243. Schirmbeck, R., W. Böhm, K. Ando, F. V. Chisari, J. Reimann. 1995. Nucleic acid vaccination primes hepatitis B virus surface antigen-specific cytotoxic T lymphocytes in nonresponder mice. J. Virol. 69: 5929-5934. Jomantaite, I., N. Dikopoulos, A. Kröger, F. Leithäuser, H. Hauser, R. Schirmbeck, J. Reimann. 2004. Hepatic dendritic cell subsets in the mouse. Eur. J. Immunol. 34: 355-365. Weiss, J. M., A. C. Renkl, C. S. Maier, M. Kimmig, L. Liaw, T. Ahrens, S. Kon, M. Maeda, H. Hotta, T. Uede, J. C. Simon. 2001. Osteopontin is involved in the initiation of cutaneous contact hypersensitivity by inducing Langerhans and dendritic cell migration to lymph nodes. J. Exp. Med. 194: 1219-1229. Saint-Mezard, P., F. Berard, B. Dubois, D. Kaiserlian, J. F. Nicolas. 2004. The role of CD4+ and CD8+ T cells in contact hypersensitivity and allergic contact dermatitis. Eur. J. Dermatol. 14: 131-138. Morawetz, R. A., L. Gabriele, L. V. Rizzo, N. Noben-Trauth, R. Kuhn, K. Rajewsky, W. Müller, T. M. Doherty, F. Finkelman, R. L. Coffmanet. 1996. Interleukin (IL)-4-independent immunoglobulin class switch to immunoglobulin (Ig)E in the mouse. J. Exp. Med. 184: 1651-1661. Caligiuri, G., S. V. Kaveri, A. Nicoletti. 2006. IL-20 and atherosclerosis: another brick in the wall. Arterioscler. Thromb. Vasc. Biol. 26: 1929-1930. Schirmbeck, R., J. Reimann. 2001. Revealing the potential of DNA-based vaccination: lessons learned from the hepatitis B virus surface antigen. Biol. Chem. 382: 543-552. Wolk, K., K. Witte, E. Witte, S. Proesch, G. Schulze-Tanzil, K. Nasilowska, J. Thilo, K. Asadullah, W. Sterry, H. D. Volk, R. Sabat. 2008. Maturing dendritic cells are an important source of IL-29 and IL-20 that may cooperatively increase the innate immunity of keratinocytes. J. Leukocyte Biol. 83: 1181-1193. Biswas, P. S., V. Pedicord, A. Ploss, E. Menet, I. Leiner, E. G. Pamer. 2007. Pathogen-specific CD8 T cell responses are directly inhibited by IL-10. J. Immunol. 179: 4520-4528. Jankovic, D., M. C. Kullberg, C. G. Feng, R. S. Goldszmid, C. M. Collazo, M. Wilson, T. A. Wynn, M. Kamanaka, R. A. Flavell, A. Sher. 2007. Conventional T-bet+Foxp3− Th1 cells are the major source of host-protective regulatory IL-10 during intracellular protozoan infection. J. Exp. Med. 204: 273-283. Trinchieri, G.. 2007. Interleukin-10 production by effector T cells: Th1 cells show self control. J. Exp. Med. 204: 239-243. Liao, Y. C., W. G. Liang, F. W. Chen, J. H. Hsu, J. J. Yang, M. S. Chang. 2002. IL-19 induces production of IL-6 and TNF-α and results in cell apoptosis through TNF-α. J. Immunol. 169: 4288-4297. Wolk, K., E. Witte, U. Hoffmann, W. D. Doecke, S. Endesfelder, K. Asadullah, W. Sterry, H. D. Volk, B. M. Wittig, R. Sabat. 2007. IL-22 induces lipopolysaccharide-binding protein in hepatocytes: a potential systemic role of IL-22 in Crohn’s disease. J. Immunol. 178: 5973-5981. Riedl, P., A. Bertoletti, R. Lopes, F. Lemonnier, J. Reimann, R. Schirmbeck. 2006. Distinct, cross-reactive epitope specificities of CD8 T cell responses are induced by natural hepatitis B surface antigen variants of different hepatitis B virus genotypes. J. Immunol. 176: 4003-4011. Riedl, P., S. El-Kholy, J. Reimann, R. Schirmbeck. 2002. Priming biologically active antibody responses against an isolated, conformational viral epitope by DNA vaccination. J. Immunol. 169: 1251-1260. Dikopoulos, N., I. Jomantaite, R. Schirmbeck, J. Reimann. 2003. Specific, functional effector/memory CD8+ T cells are found in the liver post-vaccination. J. Hepatol. 39: 910-917. Dikopoulos, N., P. Riedl, R. Schirmbeck, J. Reimann. 2004. Novel peptide-based vaccines efficiently prime murine “help”-independent CD8+ T cell responses in the liver. Hepatology 40: 300-309.